I'm off to Dubai tonight so this post feels appropriate. I will be there less than twenty four hours, but my last visit few weeks ago was a three-day trip - with a free evening. I packed my Nikon D300 instead of the usual business-trip companion: the capable little G11. I did that because I managed to include into my plan a stop at the tallest building in the world. I booked my ticket online in advance just to be sure. The visible and prominent landmark, Burj Khalifa is thankfully a beautiful looking building. It's inspired by the lotus flower and the surrounding area has been developed and landscaped beautifully, giving the tower the perfect presentation. The queues were relatively short - and with my online ticket confirmation I was able to head straight to security clearance. It didn't take long before I was through to the main foyer. The ride up was quite short thanks to the super-fast lifts. When I came out I saw a familiar view of Dubai, one that I usually see from an airplane. The interactive screens offer close-up views and some directions of Dubai's major landmarks and towns. I was surprised to find out that there is a viewing area outdoor at this fantastic height. What was even more surprising was how much of the building was still above me! It was like seeing another skyscraper when I looked up - a strange feeling at that altitude. The weather was perfect and I stayed out until sunset. Tourists, business people, families and many many photographers appeared and disappeared in that time. The views were spectacular. It's difficult to get my head around just how high I was. I'm familiar with the buildings on Sheikh Zayed Road, and its skyscrapers were dwarfed by this giant of a tower. Don't you just love the colours of Dubai's taxis from up here? It was, as it often is, quite hazy that evening. The polarisor worked wonders, but more distant subjects were just impossible to capture. 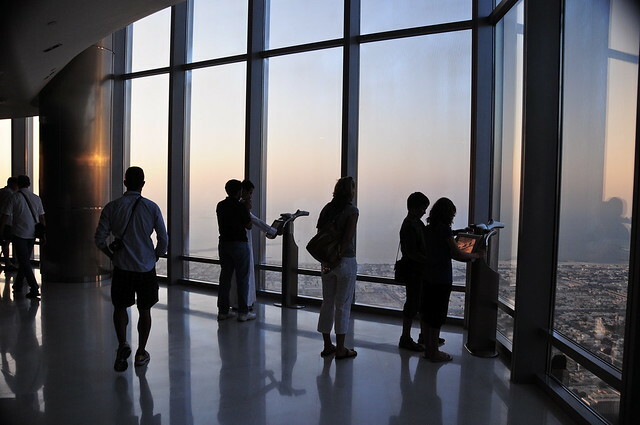 The views from Burj Khalifa are of all of Dubai, and when the World project is completed, you'll be able to see the whole world from up there!